We lost another guinea last week. Literally, as we can’t find any trace of him, which either means something big, like a coyote or fox, got him, or he was killed by a predator far enough away from the house that we didn’t find any remains, or both. He wasn’t a particularly nice guinea, at least to the other chickens. In fact, he was a bully, keeping them away from whatever food, water and scratch he wanted to keep for himself and his mate. 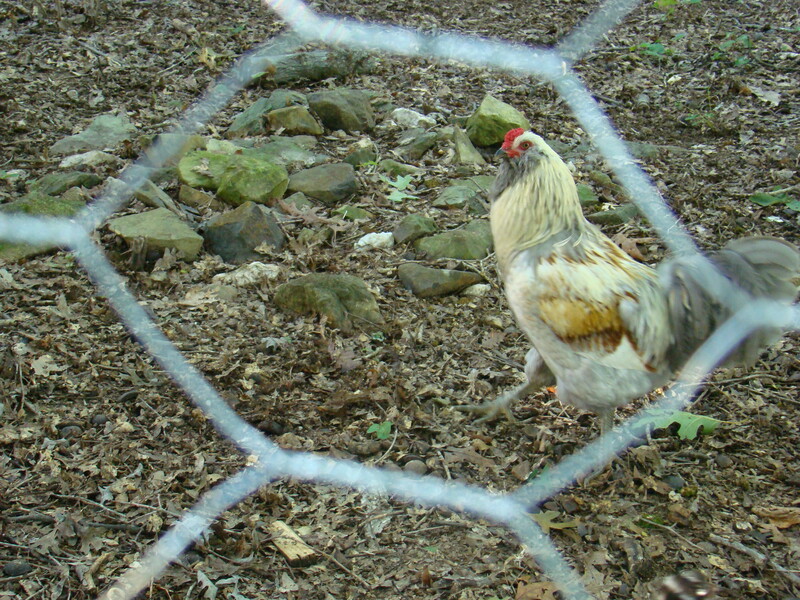 I should have liked him more, because he was a bully to Foxy and the other roosters too. And ever since Foxy went after Hatchling #2 and then me, who has saved his life at LEAST two times, if not more, I’ve been pretty pissed at him. To the point of telling the husband we had to “find a new home” for him. (I’m all for actually finding a new home for him, but no one wants a rooster, especially if you’re trying to get rid of him.) But then Foxy redeemed himself by actually doing his roosterly duty of protecting the flock, so he and I have had to learn to coexist, which generally means me walking around the yard with a broom and chasing him like a crazy lady whenever he decides to sneak up on me from behind. Coward. But back to the missing guinea. I should have liked him more, but it annoyed me that he thought he was the boss of the chickens. Especially when he tried to boss the hens around. Roosters, fine, but my girls are off-limits. So I may or may not have used my aforementioned broom to swat him away when he charged the chickens. But I don’t feel bad about that. I feel bad for his widow, Rainbow. The day Rainbow’s mate went missing, I heard what I thought were the two guineas making a huge racket out in the front. I opened the door to make sure they were okay, saw Rainbow (you can tell the females because they make a call that sounds like “buckWHEAT, buckWHEAT”), shooed her off the bench so she wouldn’t poop all over it and went back inside without another thought about it. Until the male guinea (the boy guineas never really had names because the Hatchlings gave all four guineas girl names and we never changed them) never came in to coop up. Suddenly it made sense why Rainbow was calling over and over and over again. She was looking for her mate. We started searching too, calling “coop, coop” (the guineas signal to come back to the coop) and walking all over the yard and out into the woods. Rainbow followed us calling “buckWHEAT, buckWHEAT.” Nothing. We looked again just before closing the coop up and he still wasn’t to be found. Rainbow dejectedly and mournfully walked into the coop, continuing to call for him well after nightfall. The next morning, Rainbow flew out of the coop and immediately began her ritual parade around the yard, only this time it was a parade of one. One very brokenhearted guinea calling buckWHEAT, buckWHEAT over and over. She sat in the front yard. She perched in the back. She waddled up to the pasture where she usually lays her eggs in a secret nest while her mate would keep watch over her, protecting from predators. She never stopped calling that entire day, to the point that I wondered whether birds could lose their voice. It was heartbreaking to watch. Even more heartbreaking has been the brutal reality of the pecking order reorganization. 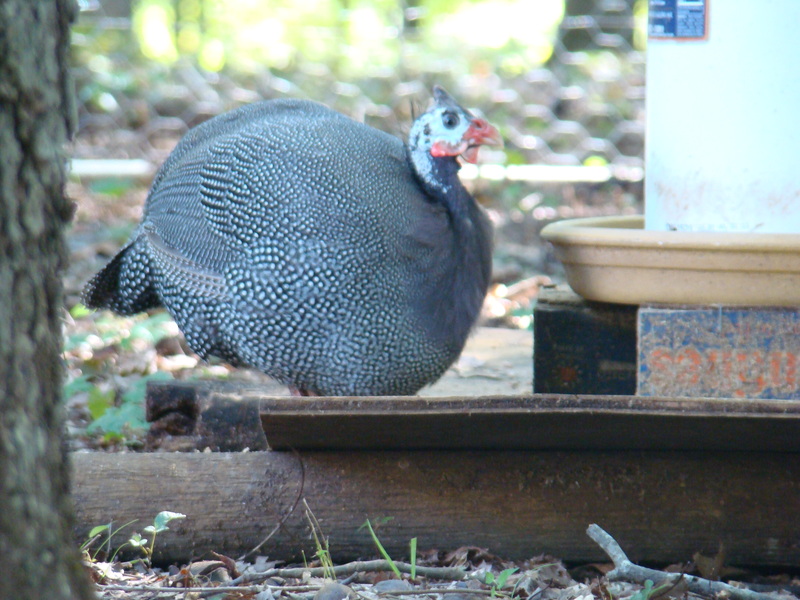 The guineas, while somewhat outside the pecking order since they’re not chickens, were firmly positioned at the top, with the male guinea protecting that position. Nobody messed with the big daddy or his mate, although he did let Foxy and his mate, Queenie, double date with him and Rainbow. But now that he’s gone, it’s open season on Rainbow. Silvermist, our second-in-command rooster pictured above (he was supposed to be a hen, which explains the less-than-masculine name) has decided that Rainbow is now his, chasing her relentlessly and pinning her down when he can catch her, tiring her out when he can’t. He doesn’t stop, and I hate watching her tread slowly into the coop at night, knowing the harassment that’s waiting for her. It’s like a bad prison movie. As if that’s not enough, she has been kicked off her usual perch on the top roost, relegated to the lowest point on the bottom roost. And yes, I do know these are just birds, but it’s still sad, especially to an accidental farmer like myself. I read somewhere that guineas mate for life and when one loses their mate, they mourn deeply. I’m not sure about the mating part, but I can certainly vouch that the mourning is a fact. Yesterday was the first day that she gave up her search, never venturing outside the new fence we had to put up over the weekend (a whole ‘nother post, working on it for tomorrow), even though she can fly over it. 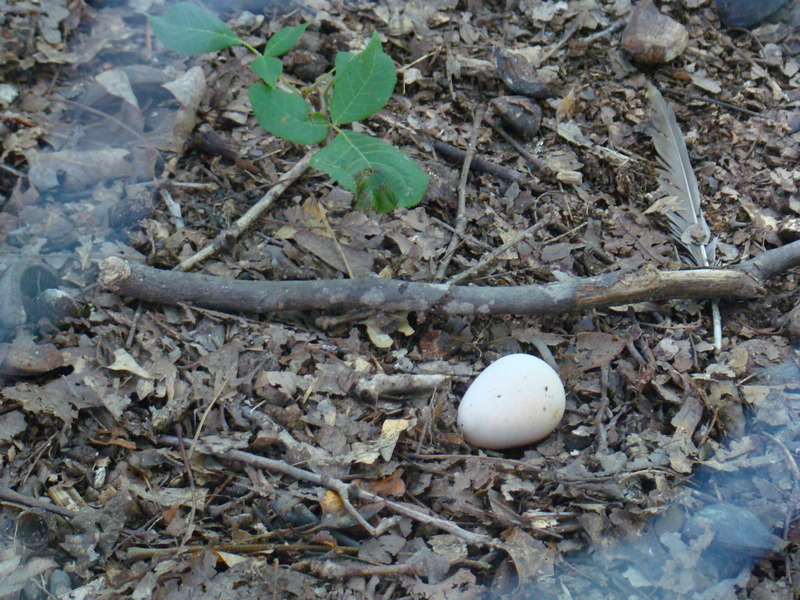 In another telltale sign, she didn’t even try to get to her nest yesterday to lay an egg, and instead just laid it and left it in the middle of the coop. Today I found another one haphazardly lying on the ground. She’s given up hope and knows he won’t be coming home. Which is why the husband and I have decided on our next adventure. Tomorrow I’m going to pick up some baby guinea keets and we’re starting over, complete with a separate guinea house. Mostly because the summer with very few ticks has been heavenly, but also partly because we want to give Rainbow some new friends and her own house. Are we cut out to be farmers? I think the husband is. Me, I thought I was but I’m not so sure sometimes despite my childhood love of hardy Pioneer Women like Laura Ingalls Wilder—sometimes the lessons of farming hit so close to home. They’re great teaching moments for the kids, but sometimes it’s more than this soft, overly empathetic Momma Hen can take. Are we crazy? I’m sure of the answer to that question.